[[image text]] SAN FRANCISCO WILL WELCOME YOU IN '42! OUR HAT IS IN THE RING! 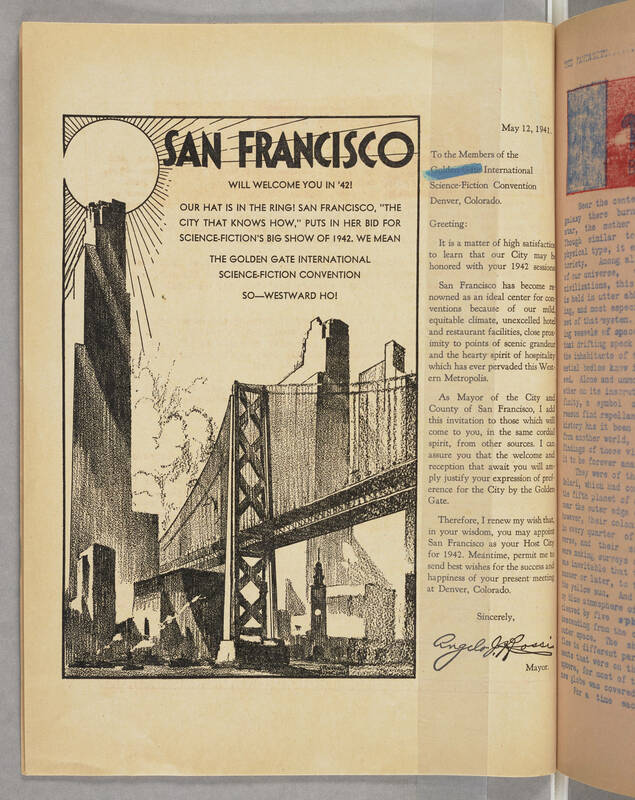 SAN FRANCISCO, "THE CITY THAT KNOWS NOW," PUTS IN HER BID FOR SCIENCE-FICTION'S BIG SHOW OF 1942. WE MEAN THE GOLDEN GATE INTERNATIONAL SCIENCE-FICTION CONVENTION SO--WESTWARD HO! [[end image text]] May 12, 1941. To the Members of the Golden Gate International Science-Fiction Convention Denver, Colorado. Greeting: It is a matter of high satisfaction to learn that our City may be honored with your 1942 sessions. San Francisco has become renowned as an ideal center for conventions because of our mild, equitable climate, unexcelled hotel and restaurant facilities, close proximity to points of scenic grandeur and the hearty spirit of hospitality which has ever pervaded this Western Metropolis. As Mayor of the City and County of San Francisco, I add this invitation to those which I will come to you, in the same cordial spirit, from other sources. I can assure you that the welcome and reception that await you will amply justify your expression of preference for the City by the Golden Gate. Therefore, I renew my wish that, in your wisdom, you may appoint San Francisco as your Host City for 1942. Meantime, permit me to send best wishes for the success and happiness of your present meeting at Denver, Colorado. Sincerely, Angelo J.[[?]] Rossi[[?]] Mayor.